These days, it seems as though we’re all looking for ways to reduce our carbon footprint. Proposed bans on straws, reusable bags (even for produce) are found everywhere, and more alternative energy sources are being implemented. Another sustainable lifestyle is also being revisited: biking to work. Commuting by bike will save you time and money. Skipping the burden of traffic by hitting the bike lane, or if you’re lucky, the bike path, can make your ride quicker and more enjoyable. The “stop-and-go” driving is also inefficient for your mileage and your wallet. And what better time to polish your new mode of transportation than summer? Here are a few tips and necessities for when you take off on two (self-propelled) wheels. Bike: the most important thing you need for your new commute is a bike, and you may be thinking, where do I begin? Well, this is all has to do with personal preference. The Strategist provides a list of best commuter bikes, and is a perfect place to get a feel for what you want. Lock: some may argue that locking your bike may be even more important than the bike you buy – you won’t have a bike anymore if you don’t have a good lock. 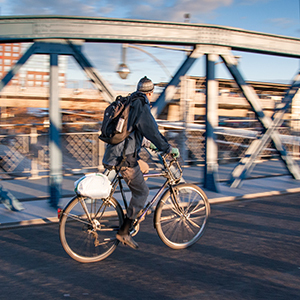 Fenders: protecting your work clothes on your commute can save a lot of time and worry. Outfitting your new ride with the proper fenders is worth the investment. Phone holder: while it’s not necessary that you be hands free on a bike, it’s always safer. A phone holder can help with navigation and easily changing your tunes. Lights: even if you do not intend on leaving work past dark, being more visible on the road is always comforting, and gives you the liberty of riding when it’s dark. Wirecutter outlines the best commuter bike lights. Capes: not all heroes wear them, but they can save the day in the rain. Having a proper rain jacket or poncho can keep you biking in all of the elements. Being at work is just as important as getting there. Here are some things that might be helpful to stash in your desk and get you through the day. Work shoes: sometimes, biking with work shoes is less than ideal, especially if you regularly wear heels. Leave a pair of pumps or loafers in under your desk and wear your gym shoes on the bike. Dry shampoo: while helmets are the best and safest way to travel on the road, they can warrant a bad hair day. Keeping dry shampoo can help freshen up your look in the office. Deodorant: it gets hot, and your commute may have hills. Keep it fresh in your cubicle. Whether you become a committed commuter or a fair-weather biker, any bit helps to reduce your carbon footprint, while fitting in some exercise and enjoying the outdoors.